Will the shutdown be over by Friday? 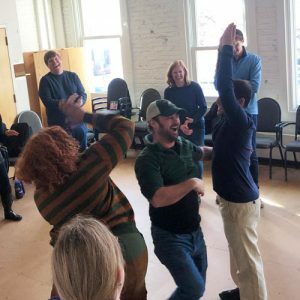 We can only hope so, but WIT will continue to share a bit of levity with furloughed federal employees through one of our free Improv for All workshops. Our next workshop for furloughed feds is this Friday, Jan. 25 at noon. The workshop will be held on Friday, Jan. 25 at noon at Source (1835 14th St. NW). If you’re not a furloughed worker and want to come, that’s fine—the more the merrier!